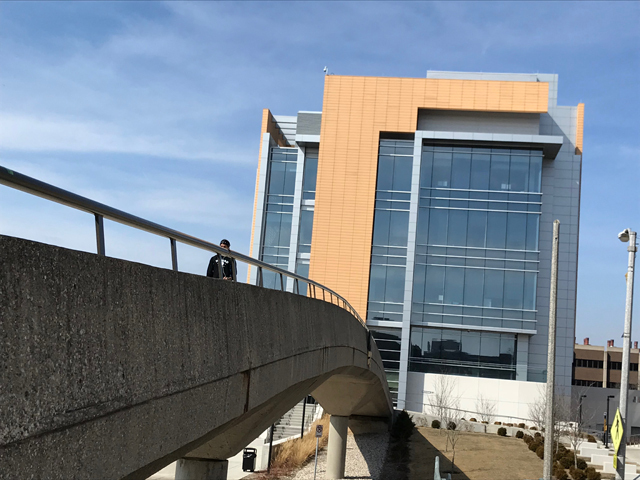 The UWM campus has a rich diversity of architectural styles thanks to its unusual history of uniting a variety of campuses into one. Published June 20, 2018 at 9:02 a.m.
Have you ever seen one of those small, leafy campuses where every building looks like a part of a matched set? No, me neither, though I'm sure they exist. Even this one in Florida, which I adore, isn't completely harmonious, even if the Frank Lloyd Wright buildings are. I attended UW-Milwaukee, which although leafy in sections (there are woods! ), comprises a rich diversity of buildings, erected during different eras, at varying heights, in a wide range of architectural styles. Though the buildings are covered in ivy, the campus history is entwined like it. "Starting from about 1890, you've got generations of architecture that were good, not so good, really bad and now they're coming back up again with the latest one here: the research center (pictured above and below). It's a very fine building." 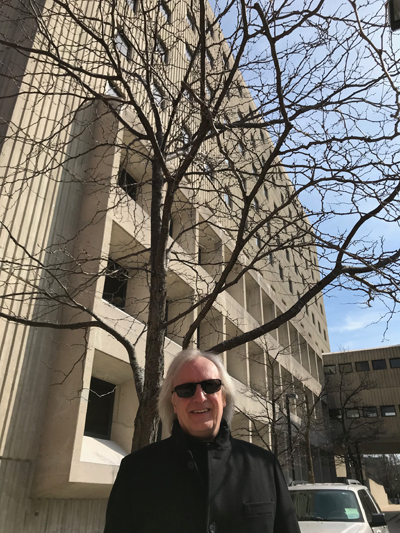 That's Robert Greenstreet, dean of the School of Architecture and Urban Planning, professor of architecture and former interim university chancellor, speaking in his office one sunny early spring day before we head out on a campus walking tour. "The interesting thing is that it was actually four campuses originally. You've got the seminary, a woman's college, the normal school and the University School. So it was kind of a sewing together of these campuses." The distinctive red Eschweiler-designed buildings near Hartford and Downer were home to the Milwaukee Downer College, which was formed in 1895 when the Milwaukee College (founded in 1853 as the Milwaukee Female Seminary) and Downer College (born in Fox Lake in 1855 as the Wisconsin Female College) merged. The Normal School (later the State Teachers' College) moved up to its new home – the current UWM Mitchell Building (pictured below) – after outgrowing its home on 19th and Wells in 1909. University School began life as the German-English Academy Downtown in 1851, and moved into a new building along Hartford Avenue in 1926. The school moved to River Hills and sold the Hartford building at the end of the 1950s. 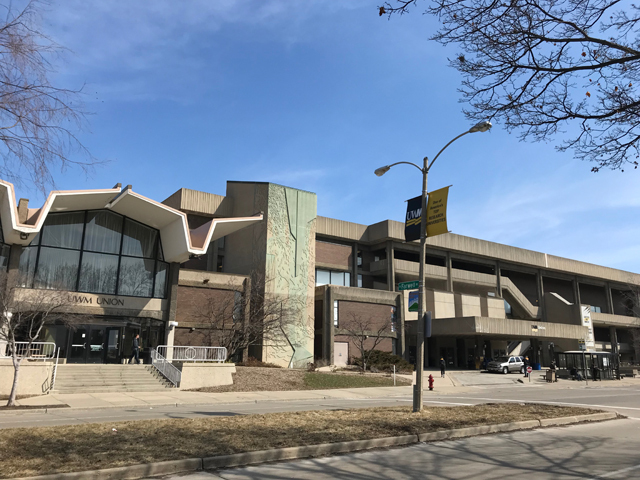 UWM was created in the mid-1950s from a merger of the UW's Milwaukee Extension – then located on 6th Street Downtown – and the Wisconsin State College of Milwaukee, formerly the State Teachers' College. 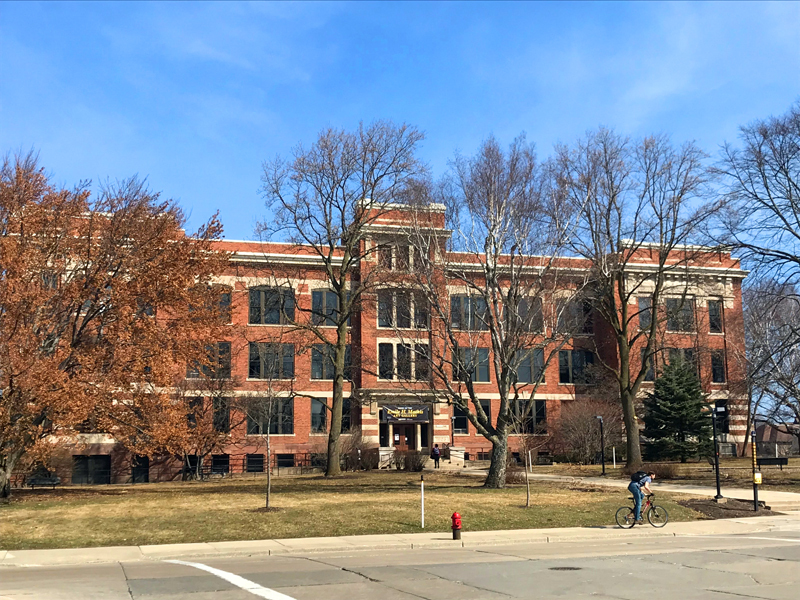 The former University School site is now called Engelmann Hall, 2033 E. Hartford Ave. and it's a Tudor Revival building designed by Van Ryn & DeGelleke, who did similar buildings (like Riverside High) for MPS. An Eschweiler-designed expansion was added in 1958. A block east is the castle-like Chapman Hall, a splendid collegiate gothic building designed by Howland Russell in 1910 as a library for the Milwaukee-Downer Seminary. When we visit, Greenstreet points out how the structural system used to make the building strong enough to house stacks of books in its center portion means it's got limited uses now. "It's a bit like Australia," he quips, "only occupied around the outside." Of course, a little further along, one comes to Holton, Johnston and Merrill Halls (pictured above), with Sabin and Greene Hall and Museum to the north, and Vogel and Garland/Pearse across Hartford. 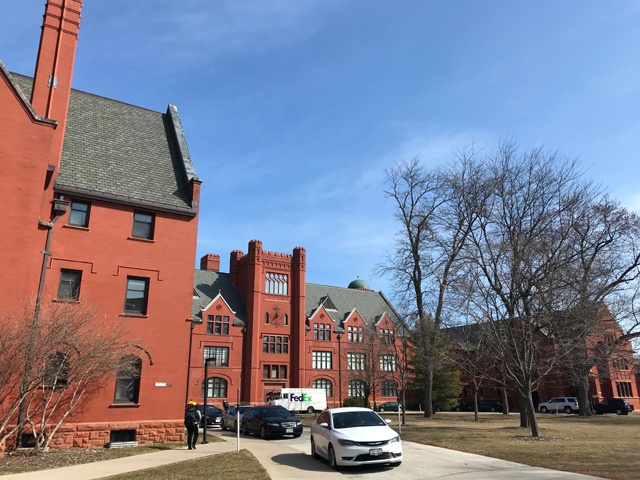 These red tudor and gothic structures are the closest UWM comes to a unified campus and all were designed by Alexander Eschweiler & Co., except Sabin, which was drawn by Van Ryn & DeGelleke. Newer buildings, like Enderis, Bolton and Curtin Halls – as well as the physics and chemistry buildings on the western end of campus – arrived in the latter decades of the 20th century. 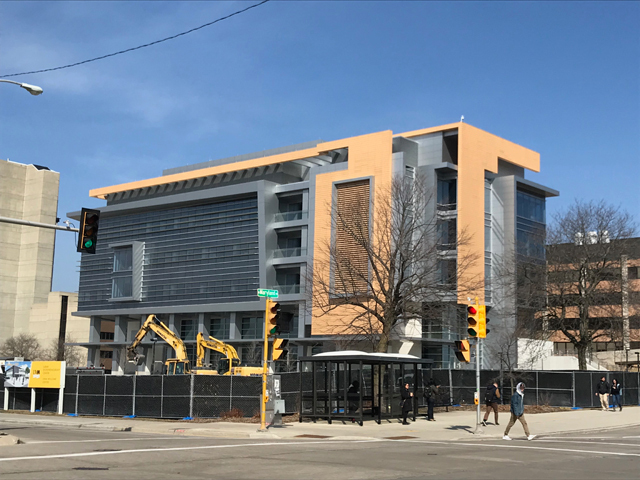 Curtin's brutalist concrete hulk along Downer Avenue, is a popular whipping boy. But Greenstreet disagrees. "The '70s were not a good time in architecture generally," he says. "That was the period of new brutalism. We should've realized at the time the word brutalism was possibly not the most effective way of dealing with people, and we have a couple of examples here that have won state awards for being as ugly as they are. The Union (pictured below) is well-known as being one of the worst buildings in Wisconsin. It's got awards for it. It really has. "I am actually the only person I think in Southeastern Wisconsin that quite likes Curtin Hall. I like the sculptural form. Inside, it's a mess, but on a blue sky day, I quite like it's sculptural impact. I have to say I'm the only one. It's kind of embarrassing as well because the designer of that, of that and the Union, same designer." While Greenstreet isn't a big fan of the four Sandburg Hall dormitory towers – of the last one erected he says, "it is successful, at least, in making the other three look better" – he is rightly enthusiastic about the bright 2005 addition to the Klotsche Center (pictured below), with its welcoming lobby – designed by Milwaukee's Zimmerman Architectural Studios – the School of Architecture's home and the aforementioned Kenwood Interdisciplinary Research Center, designed by Flad Architects. 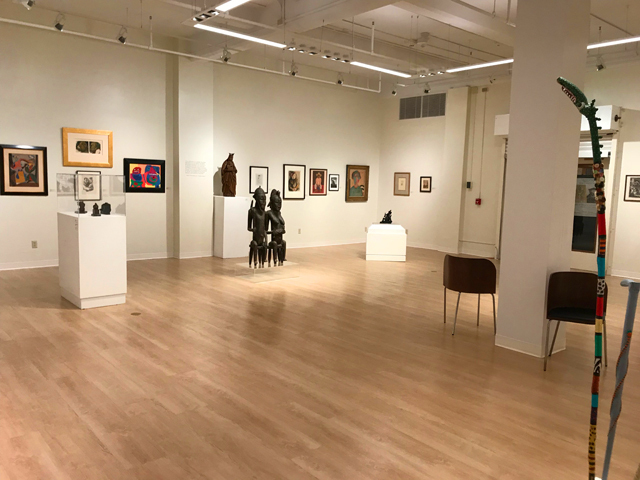 We pop into Mitchell Hall, where Greenstreet shows off the new Emile H. Mathis Gallery (pictured below), which is really quite impressive, and definitely worth a visit. 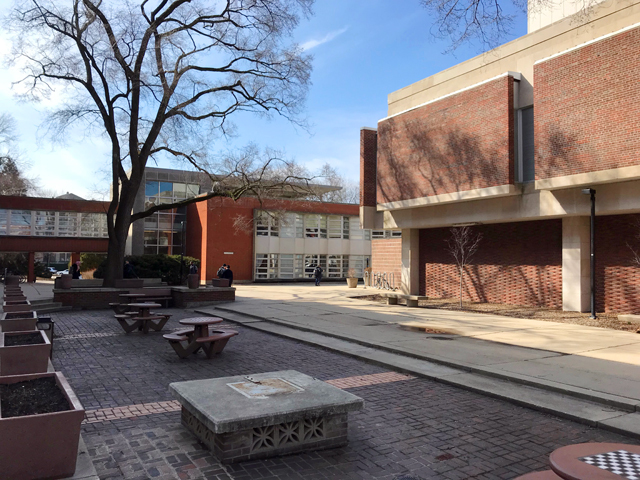 We also check out the way the university has taken some moribund space in the Golda Meir Library and activated it with seating and a coffee bar. 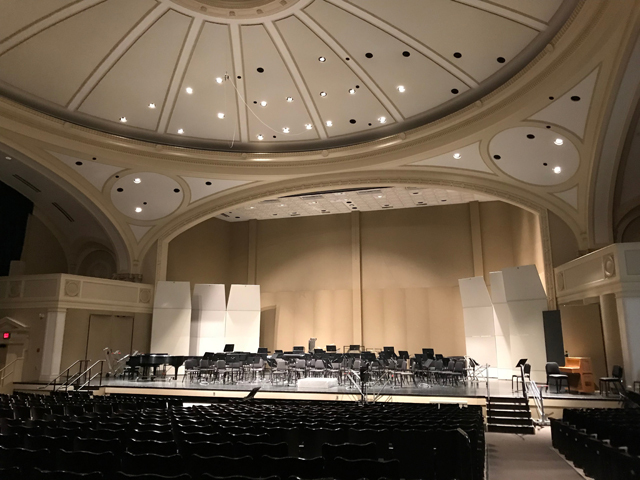 And we cross Kenwood Boulevard to take a look inside the Zelazo Center for the Performing Arts and its Helen Bader Concert Hall, designed by Robert and Henry Messmer and erected in 1922 as a home for Temple Emanu-el B'ne Jeshurun. There's a gorgeous domed ceiling above the 758-seat auditorium and Greenstreet shows me that because there's no backstage, a former utility tunnel (pictured at right) now serves to bring performers to and from the stage. The biggest challenge the university faces, says Greenstreet, is weaving all of this together. 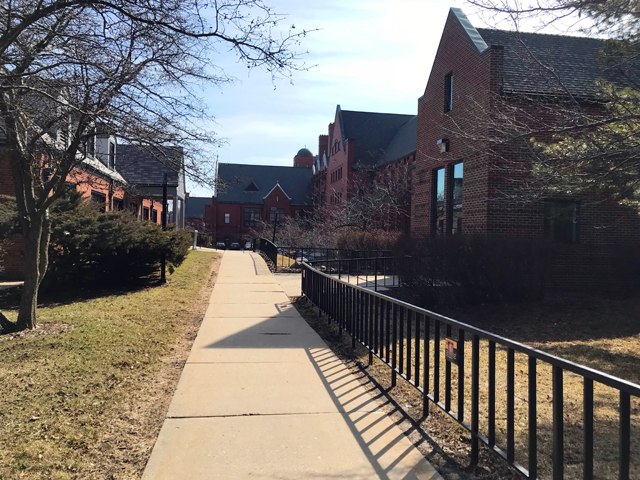 "It really wasn't until I would say in the '80s and '90s that we started understanding that campus was less about just buildings plunked on a big three-block site, but it was actually the spaces in between, as well," he says. 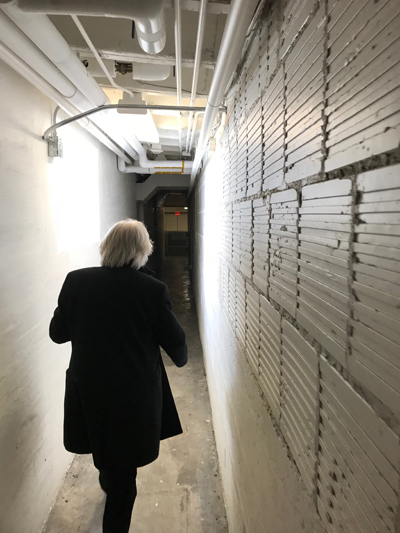 This walk we're on, which traces one he often takes with new students, he says, "takes us through some of the bits that glue it all together, because there are actually some quite nice outside spaces, which are kind of outside rooms, which we don't kind of think about quite as much." 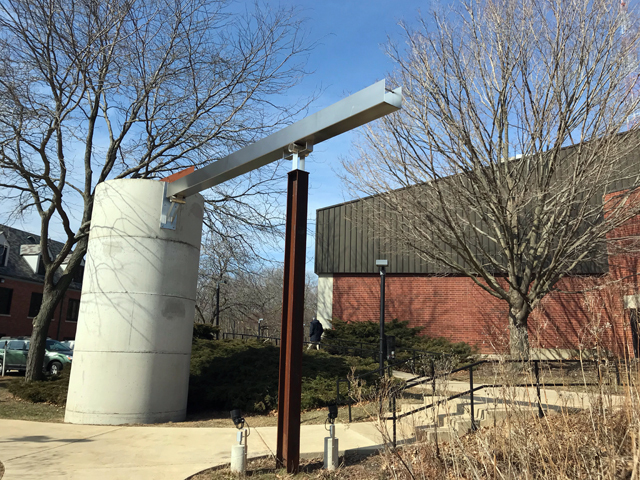 Near Chapman Hall, we visit a bioswale and big concrete cistern (pictured below) that help alleviate runoff into the storm sewers, and Greenstreet notes that some campus buildings have green roofs and others, notably the research center, are LEED certified. "This is the state school of architecture," he says. "The only one in the state. So, we've stuck our noses in wherever we could and done a lot of stuff. All the green roofs on campus, all the sustainability stuff has come out of the (architecture) school, for example." 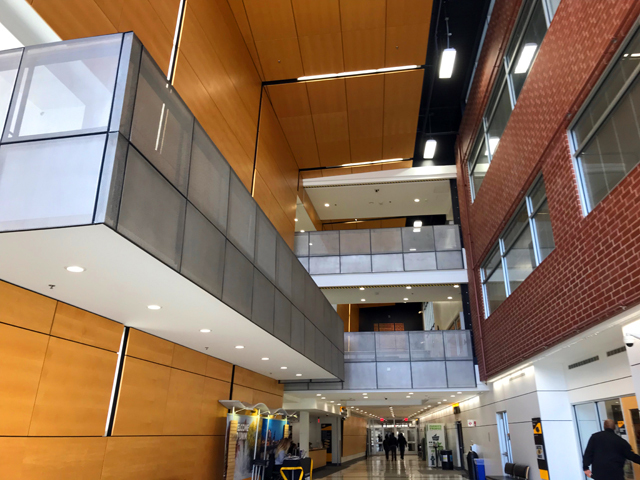 But one of the biggest changes on the UW-Milwaukee campus has actually occurred off campus, or off what has traditionally been considered campus. "We started life Downtown of course in the 1880s," he says. "In fact my school, which is 50 years old next year, was initially Downtown on the extension campus. But we kind of consolidated around here. "Now we've always owned other things. We owned a bunch of caves with a lot of bats in somewhere around here. We always owned the Great Lakes facility for example. There were about five or six facilities around the state that were UWM but they were small research facilities." But those facilities didn't have much of a public profile. "They were hidden," says Greenstreet. "For the public it's really hard (to get to). It's easy to get to but you can't park anywhere near here. So we've really made a huge effort to get out into the city. Public Health is Downtown, which is where it should be. Great Lakes has expanded so it's become quite an important site. (The School of Architecture) takes vacant space in buildings in the city and we do something called Design Box, which is a pop up gallery. We do exhibitions, we do public events and we take architecture into the city." 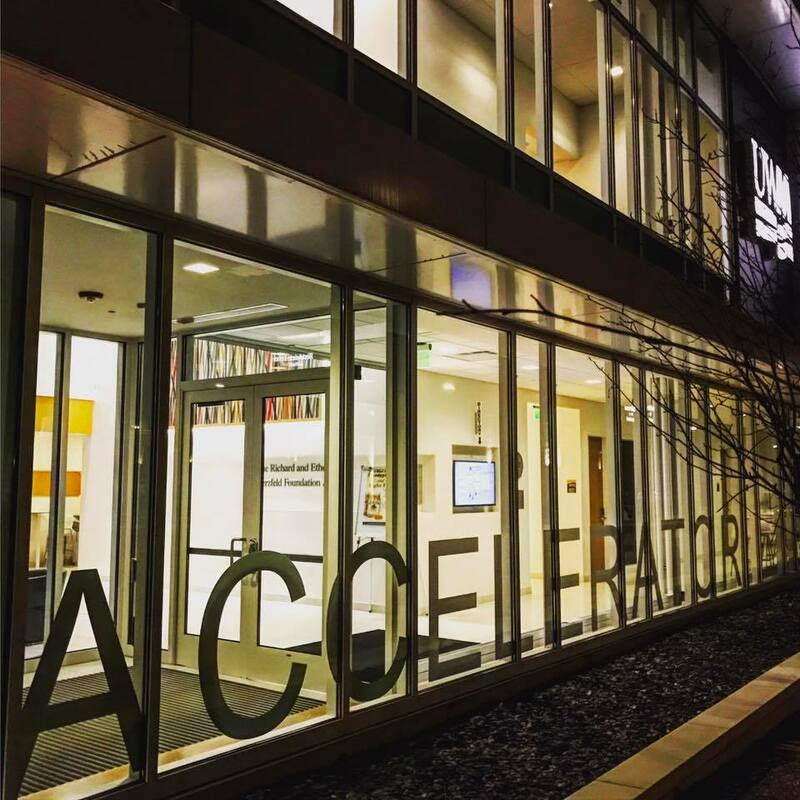 The UWM Innovation Accelerator is out on the County Grounds. Greenstreet says many of the university's departments are looking for ways to reach out into the broader community. "Every school is trying to kind of break away and to get out and take what we do into the community. We're very community-orientated. You've got the Grand Avenue component (School of Continuing Education) as well and you see the sign for it on the skyline. "I like the idea that UWM isn't just seen as this campus. You know that UWM is a much more pervasive presence around the town because you see it pop up."